Mild is the watchword for the next couple of days. The region is looking at a dramatic warmup through Wednesday, with Tuesday likely hitting a high of 68 degrees. 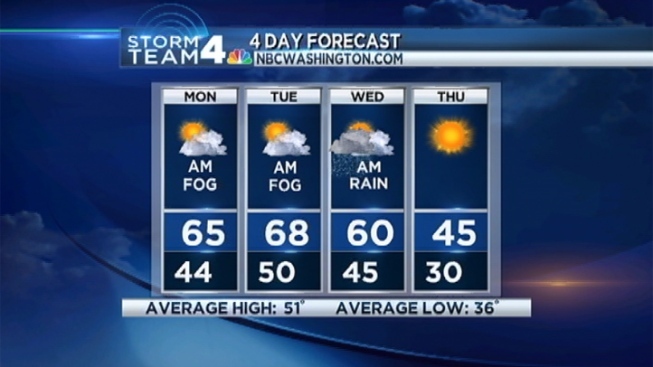 While there is dense, patchy fog through parts of the region -- things should be mostly sunny by midday Monday. According to Storm Team 4 Meteorologist Tom Kierein, the average temps around this time of year is 51 degrees. Not to worry, though, we'll get back to normal fairly quickly. While highs will reach 60 on Wednesday, Thursday will likely see a steep drop to 45 degrees.